EUROPE: A total offshore wind capacity of at least 230GW is needed in northern Europe by 2045 to meet the requirements of the Paris Agreement, according to newly published research. Of the 230GW total capacity, 180GW would be installed in the North Sea itself, covering approximately 5% of its total area, with the remaining 50GW in other seas, the consultants added. Beyond 2030 there would be only a "marginal" increase in capacity because "almost all suitable locations for onshore wind will be exploited by then", Ecofys wrote in its ‘2045 outlook and implications for offshore wind in the North Seas’ report. The spatial planning required to meet the 2045 target was an "international challenge", Ecofys noted, and stressed that cross-border collaboration would be needed. To meet the 230GW target "the offshore wind installation rate needs to increase considerably", Ecofys wrote. On average, approximately 3GW a year of offshore wind is expected to be added until 2023, and Ecofys assume an additional increase of 1GW year-on-year between 2023 and 2030. This approach, with a net installation rate of 10GW a year from 2030 onwards, would be sufficient to reach the 230GW target by 2045. But the report’s authors warned: "New policies and market integration progress are required to ensure an increased roll-out after 2023 to enable reaching the 2045 target. "A higher ramp-up could be difficult to achieve due to the required expansion of industrial fabrication and installation capabilities. "A lower ramp-up, on the other hand, would yield the 2045 target difficult to attain." Cross-border cooperation is needed to develop wind farms in a cost-effective manner while also ensuring maximum benefit to the environment, as well as to develop an overall spatial planning strategy, Ecofys stated. The report’s authors wrote: "While there is sufficient space to develop the required offshore wind capacity, a careful balance needs to be maintained between ensuring maximum benefit to the environment on the one hand, and cost efficient development of both wind farms and associated infrastructure on the other hand. "This requires a long-term view and close collaboration between all North Seas countries, taking into account changes in use (for example, decommissioning of oil and gas infrastructure), and an overall spatial planning strategy that ensures cost-efficient utilisation of the resource, aligned with off- and onshore grid development and with maximum benefit for the environment, recognizing all stakeholders' interests." Countries such as Denmark and the United Kingdom, Ecofys noted, have "overabundant space" in their parts of the North Seas to meet their national requirements, whereas other countries, such as Belgium and France, lack sufficient space to do so. Disparities such as these highlighted the need for collaboration, the reports’ authors stated. In the scenario outlined by Ecofys, offshore wind becomes the "dominant generation source for north western Europe", the consultants wrote. For the power system to cope with greater penetration of variable renewables generation, the use of new flexibility sources such as storage and demand response "will become essential", Ecofys stated. High levels of interconnectivity would be a "crucial enabler" for such a flexible power system, the authors added. 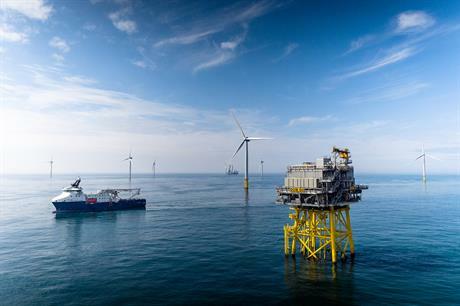 The latest pan-European Ten Year Network Development Plan, published by the European Network of Transmission System Operators for Electricity (Entsoe) last year, covers about 17GW of offshore interconnection across the North Seas by 2030. But according to Ecofys’ 230GW scenario, a minimum offshore interconnection of between 50MW and 80MW between the UK, Ireland, continental north west Europe and the Nordics, would be needed. To meet this, operators would need to "develop a methodology to value grid stability that incentivises interconnector capacity to maintain operational security", Ecofys wrote. The consultancy predicts a 50% reduction in total energy demand by 2045, relative to 2010 levels, full decarbonisation of electricity generation and with electricity meeting 45% of energy demand in Europe by then. If electrification of energy increased to 50%, target for offshore wind would rise to 280GW, the consultants added.